Here we are at the last installment of my prayer flag series! In Part 1, I shared some of the history and lore behind the flags. As I’ve made my nontraditional, gypsy flags, I’ve loved giving a nod to the Tibetan traditions; be it through color, meaning, or placement. I plan to hang mine diagonally, between trees and shrubbery in my backyard. In Part 2, I showed you some examples of both traditional prayer flags and homemade gypsy prayer flags. The rebellious, anything-goes nature of the gypsy flags really speaks to my artist’s heart! 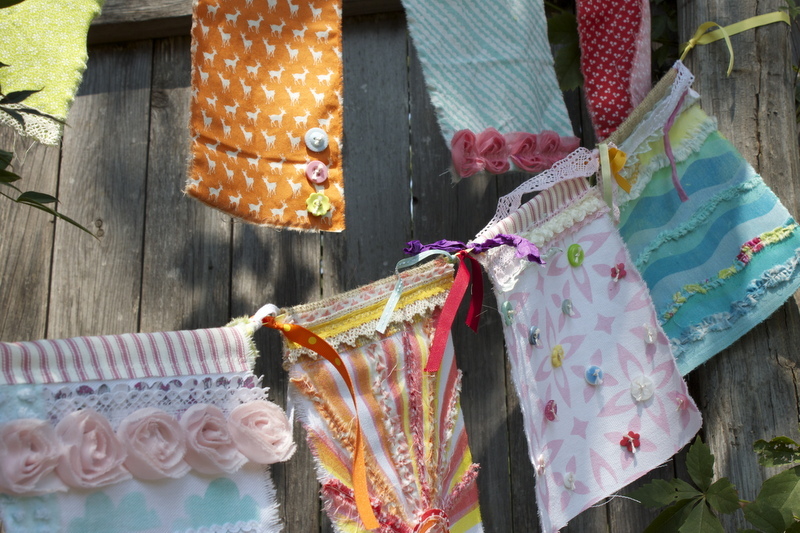 For Part 3, I was so happy to feature my friend Kate and her prayer flag story. I talked a LOT in today’s video about imperfection and I think Kate’s photos of the faded flags really brings that point home – time is going to make them even more beautiful than you could imagine! So, let go and just have fun with them!! And, today, I’m wrapping the whole thing up with a tutorial for how I made the water flag in my gypsy prayer flag set. Without further ado, here is the video (see supplies list at the bottom of this post). I hope this series has inspired you to create your own set of gypsy prayer flags. If you do, I would love to see photos – just come back and comment with a link and I will happily come visit! Note: I’m not affiliated with any of the companies or products I’ve linked above. I’m just sharing the first link I found for the different products I particularly like to use. Beautiful project. The colors and textures you chose are fantastic. Thanks for the great tutorial. Great series!! Your timing is amazing– I’m bringing supplies to make prayer flags for gifting at a music /sustainability festival this coming weekend in Tucson AZ! They will be decorated by participants and hung around the festival then taken home. You’ve given me more ideas than any other site I’ve looked at. Thank you ever so much & YES I will be back with pictures! !